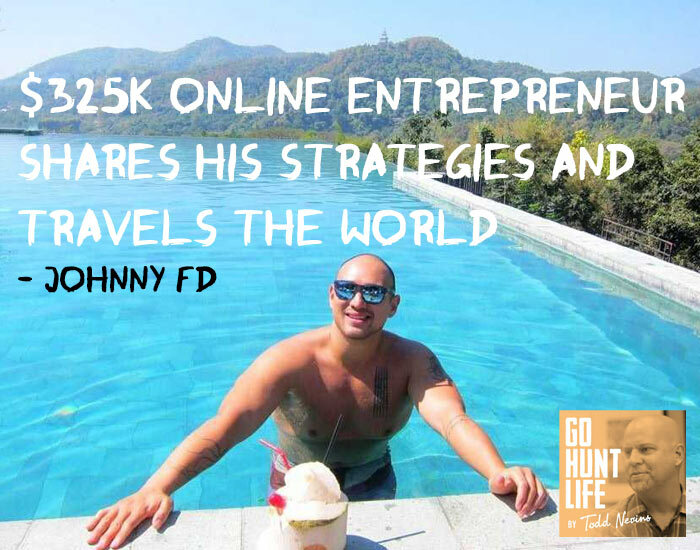 Johnny FD is an online entrepreneur, location independent and the Boss when it comes to working like crazy building online businesses while traveling the world full-time. Last year made $325K and the month before this conversation he made $39,000 but in 2013 he was down to his last $1,000. He is an impassioned online entrepreneur and digital guinea pig when it comes to learning how to make passive income online and build digital businesses from anywhere in the world. If you’ve researched ways to make money online then you’ve probably come across the terms dropshipping, Amazon FBA(Fulfillment By Amazon), affiliate marketing, eBook publishing, teaching courses on Udemy and Skillshare and even making money podcasting. Become a Patron for Go Hunt Life for as little as $1/episode, get behind-the-scenes action and a shout out! But even if you are new to these terms and how to make money online you’ve found the right episode because Johnny is an incredibly good teacher and he spells out how he’s amassed his fortune in just a few years. A couple of other things that Johnny is good at is being completely transparent so others can learn from his success AND his failures. Quitting his safe job in California to be a dive instructor and be a Muay Thai fighter in Thailand after reading the 4 Hour Work Week. Running out of money and being down to his last $1,000 in 2013. Monetizing online with drop shipping, teaching courses, publishing eBooks and designing an affiliate marketing program. Living in Bali Indonesia as a location independent entrepreneur. Hosting the Travel Like a Boss podcast and the two episodes that he thinks about the most. Making $325,785.19 last year and $39,000 last month. He shares everything on what’s worked him, what hasn’t and how you can get started on building a side hustle gig making a few thousand a month to making serious online passive income. Johnny’s 2 podcast episodes that he thinks about the most: #10 with Anton Kraly, AntonMethod for dropshipping, and #131 with Nicolas Gregoriades, DigitalCommunion.